The Trojans abducted Helen, and the Achaean princes took advantage of the opportunity to lay siege to this proud city. But war during ancient times has its own set of rules. Being more than just a single, well-organized army, the Greeks will present an assortment of princes, each fighting for his own glory. Each player is an incarnation of one of these characters! The game proceeds in several successive sieges (phases of the game) during which victory cards are brought into play. 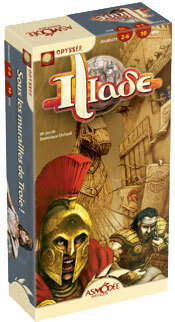 With the aid of the cards in his hand, representing all the components of an ancient army (hoplites, archers, elephants, various siege engines, including the famous Trojan horseâ€¦), each player will construct a powerful army before himself, and will have to choose between sacrificing new cards from his hand (since those are not inexhaustible) or utilizing the abilities of the cards he has already placed. Each player will have to form the best army from these cards, torn between the multiple choices offered to him with each round of play. In this new, very tactical card game, Dominique Ehrhard brilliantly revisits the mechanisms that made CondottiÃ¨re so successful. The superb illustrations by John Mac Cambridge, antiquity fanatic, are an additional invitation to join the voyage. This game is way better than I ever could have guessed. I grew up playing Spades, Euchre, and the like....... this game reminds me of them, except that it builds from hand to hand, and the person who manages their resources (and properly cutting their losses) will have the advantage in the next round. Great theme, great art, great feel, great game.